Even with all the amazing social web tools available out there – e-mail remains a key communication tool for most people. For many committees, projects and associations – an e-mail list has a lot to offer as a co-ordination and collaboration tool. This morning I’ve been working on preparing a web presence for the DFID Civil Society Organisations Youth Working Group (a group of development agencies and youth charities focussing working with the Department for International Development to promote youth engagement and the role of young people in development), who are currently only online via the Youth Guidance Project. Because the Youth Working Group is essentially a network of organisations and individuals, with no permenant secretariat or central body – we’re building the whole web presence around e-mail lists for the central group and it’s sub-groups – set up to be open to anyone who wants to get involved. Content from the e-mail lists will be fed via RSS ito a website based on DokuWiki (a fantastically flexible and easy to use wiki). This set-up will involve the chair of each sub-group managing their own e-mail list, and all the members or associates of the Youth Working Group understanding how an e-mail list works. 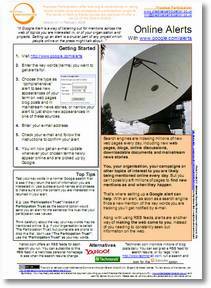 So – I took the opportunity to create a ‘One Page Guide to E-mail Lists with Google Groups‘. You can download the PDF here, view the full thing below or on Scribd, and get the original to adapt for your own use in it’s original Open Office format, or MS Word if you prefer. P.S. A slight tweak in the design this time, copying an idea from Amanda‘s adapted versions of the One Page Guides for 2Morro festival (under ‘Get Involved’). Michele Martin has just dropped me an e-mail with a link to some remixed versions of the one page guides series. You can find the original one page guides they are based on here. Have you been using any of the one page guides? Are there other remixed copies out there that I don’t know about? What should be next in the series? I’ve not created any for a while – but I’m hoping to put together one or two new guides soon – what you would like to see? Update: Lacona Coy has put together a post linking up the One Page Guides with Commoncraft videos for each. A handy getting started reference. These two one page guides were written very specifically for the Young Researcher Network launch conference and look at online video editing and using the voicethread tool for collaboratively narrating slide shows and presentations. I was introduced to VoiceThread by Al Upton and the miniLegends during the 31-days to a better blog challenge this summer. It's a really interesting tool, and so, with this one page guide my aim has been to offer an introduction to VoiceThread, but to leave open to discussion it's possible applications. 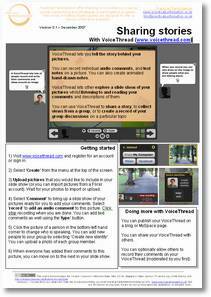 I'd love to hear stories from those who have used VoiceThread in any consultation, participation or youth work contexts. You can download the introduction to VoiceThread as a word file here (PDF coming when I get hold of a better PDF convertor which handles translucency without it looking horrible…). The second guide outlines how you can edit video online using MotionBox. For users whose computer systems are firmly locked down by the corporate or local authority IT department, online editing may well present one of the best options for quickly creating and sharing effective video content. 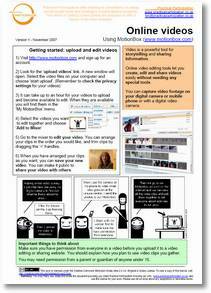 You can download the Online Video Editing with Motionbox guide as a PDF here, or grab the original word file to modify from here. MotionBox is one of many tools that have recently emerged for editing video online. I chose it for this guide as, of those I knew at the time, it seemed to offer the best 'walled garden' of video content that I felt comfortable using with a group of young people aged 13 to 25. I'm planning to explore JayCut as an alernative tool worthy of a one page guide soon. Does anyone reading have experience with other online video editing tools? Which would you recommend?